Perfectly Located WaterColor Condo with GULF VIEW! With Gulf views from its balcony and living room, this top floor WaterColor condo is sure to please! You will be amazed at the unit's offering of cool paint tones and calming beach serene furniture. With many windows and French doors, you will feel like you are just above the beach on your own private cabana. The oversized balcony with gulf views is such a treat. 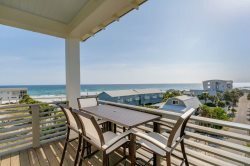 Gulf views in Watercolor and Seaside are rare which makes this condo the ideal property to rent. Have a glass of wine, read a great book, or just enjoy the sights of 30A and Watercolor from this fun outdoor living space. The living room provides sleeping for 2 more people on its new 'big comfy' sofa sleeper accompanied by two more chairs and new flat screen TV to chill out. A half bath can also be found off of the main living area. The master bedroom is a definite place to get some rest and relaxation after enjoying a long day at the beach with an antique king sized bed and flat screen TV. The master bathroom has a double vanity and spacious shower. Upstairs, you will find the fun loft area with a double bed. Very cool Loft that sleeps 2. Walk to the WaterColor Beach Club and Gulf of Mexico in less than 1 minute. The location of this property is superb in every way. You will also be able to ride the complimentary Beach Cruiser Bikes around 30! WaterColor is currently in the process of a community-wide upgrade and installation of fiber cable to every home in WaterColor, which will make WaterColor the first community along 30A with "fiber to the home" (FTTH) cable and Internet service. FTTH uses optical fiber from a central point directly to individual residences, which results in much higher Internet speeds. Once installed, every home in WaterColor will have access to 100 Mbps Internet speeds. This project will be completed by mid May 2017! Come and enjoy your WaterColor and 30A vacation. We loved this condo and the super close location to Seaside. Jessica was very helpful and knowledgable. She handled all of the details from planning our stay to check-out. This property was exactly what we needed...a beautiful home with an amazing view and literally steps from the beach and restaurants.